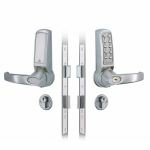 With the Codelocks CL4020 Medium Duty Electronic Mortice Lock with Anti Panic, the external knob freely turns without operating the latchbolts. When a correct code is inputted, the blue LEDs light up and the knobs retracts the latchbolt. The spring latch will automatically lock the door when the door closes. The key will unlock the door for management functions and you can programme the code free mode at the keypad using the master code. The lock is able to store up to 80 various user codes. Codes can be between 4-6 digits long, and programming is available through the keypad, using the master code. 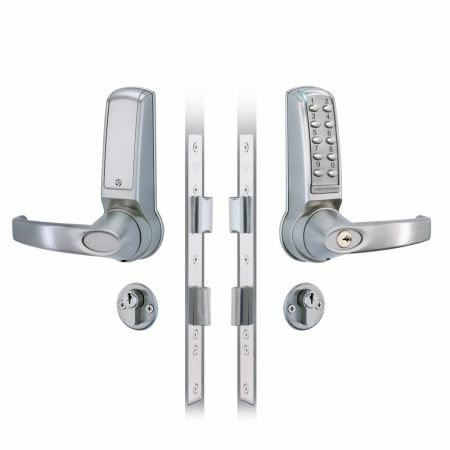 The lock has two alarm release terminals fitted as standard. REM1 can be used to open the lock from a reception desk button or answer phone. REM2 can be linked to an alarm system which, when activated by a momentary contact, can release the door for half an hour. This lets emergency personnel access the room to quickly ensure see no one has been trapped and overlooked. The LED lights look great on this code lock and the finish suits the office doors a treat.